There a certainly a good number of 5 star hotels in Paphos to choose from and which one you finally decide to stay in, is simply down to your own personal requirements, needs and budget. All of the five star hotels in Paphos offer a wide range of facilities that you would expect from hotels of this high star rating. One thing you should take into consideration when booking your hotel in Paphos is its location. 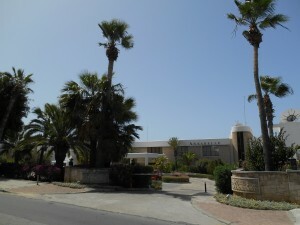 Although there are a number of five star hotels in paphos, they are all located in different areas. Some of the hotels are located in the centre of Paphos whilst others are located along the coastal roads and also in the resort of Coral Bay. If you are wishing to stay more central to Kato Paphos (the tourist area) then obviously, it is wise to ensure you choose a hotel that is either located in the centre or that is within easy access of the main tourist centre of Kato Paphos. There are regular bus services that run along the coastal roads throughout the day and night, which make getting to and from the main tourist area relatively easy. There are also regular bus service that run to and from Paphos Airport. Over the few years, Paphos has become a very popular destination for weddings and as a result, many of the 5 star hotels in Paphos have been a popular choice of venues to hold the weddings service and reception. Many of the hotels offer special deals for wedding parties and if you are hoping to ‘tie the knot’ at one of the five star hotels in Paphos, it is advisable to contact the hotel direct and speak with them to see if the can offer you a special rate. If you are wishing to stay in one of the 5 star hotels closest the centre of paphos, you should start by looking at The Annabelle hotel and Almyra hotel. These two hotels are the closest hotels to the main tourist in paphos and are within easy walking distance of the many bars, cafes, restaurants, shops and the harbour. The Amathus hotel is also quite close but is located a little further along Poseidon Avenue and takes around 15-20 minutes to walk into the centre. Below is a list of all the 5 star hotels in Paphos and also the distances from Paphos Airport to each hotel. Elysium Hotel: Located on the coastal road next to The Tombs Of The Kings the Elysium Hotel in Paphos is a little way out from the main tourist area. However, the hotel is within easy access of the main tourist area of Kato Paphos and can be reached in several minutes by bus, taxi or car. Distance from Paphos International Airport is approximately 7.7 km (4.8 miles). Constantinou Bros Asimina Suites Hotel: Located on Theas Afroditis Avenue (which joins Poseidon Avenue) close to the water park, the Constantinou Bros Asimina Suites Hotel in Paphos is a further away from the main tourist area but is still within easy reach. Amathus Beach Hotel Paphos: The Amathus Beach Hotel is located on Poseidon Avenue but is a little further out than some of the other hotels such as The Annabelle and Almrya hotels. However, although it is a little further out, it still only takes around 15-20 minutes walking to reach the main tourist area and harbour. There are also regular bus services that run along Poseidon Avenue throughout the day and night. Coral Thalassa Boutique Hotel & Spa: Located in the Coral Bay area, the hotel is close to Paphos Bird and Animal Park, and Paphos Zoo. The Annabelle: The Annabelle hotel in Paphos is located on Poseidon Ave, and is perfectly situated close to the main tourist centre of Paphos and the Harbour. Azia Resort & Spa: The Azia Resort & Spa is located on the coastal road from Paphos to Coral Bay. The hotel is approximately 6.8 klms from the main tourist area of Kato Paphos. Distance from Pafos airport is approximately 13.6 km (8 miles). Almyra Hotel: The Almyra hotel in Paphos is situated on Poseidon Ave and offers the ideal base if you are wanting to be close to the main tourist area of Kato Paphos. Distance from Pafos Int airport is approximately 7.7 km (5 miles). Venus Beach Hotel: The Venus Beach Hotel is located on the Tombs of The King Road, which is a little out from the main tourist area of Paphos. However, there are regular bus services that run along the road throughout the day and getting to and from the hotel is not a problem. Distance from Paphos PFO airport is approximately 11 km (7 miles). Coral Beach Hotel and Resort: Located by the sea in Coral Bay, the Coral Beach Hotel and Resort is the perfect choice if you are looking at staying in the Coral Bay area of Paphos. Distance from Paphos PFO Int airport is approximately 20 km (12.5 miles). Coral Thalassa Boutique Hotel & Spa: Situated within easy reach of the Coral Bay area and beach, the Coral Thalassa boutique Hotel & Spa is another great choice of 5 star hotels in the Coral Bay area. Distance from Paphos airport is approximately 19.5 km (12. miles). InterContinental Aphrodite Hills: The interContinental Athrodite Hills hotel is situated approximately 7.5 miles from the airport and is located in Kouklia. Kouklia is situated close to Aphrodite’s Rock and is also close to both the Aphrodite Hills and Secret Valley Golf Clubs. The hotel is actually quite a distance from the main centre of paphos and is located 15 miles Southwest of Paphos itself. The hotel is not an ideal hotel to stay in if you wish to be based near to the main tourist area of Kato Paphos.